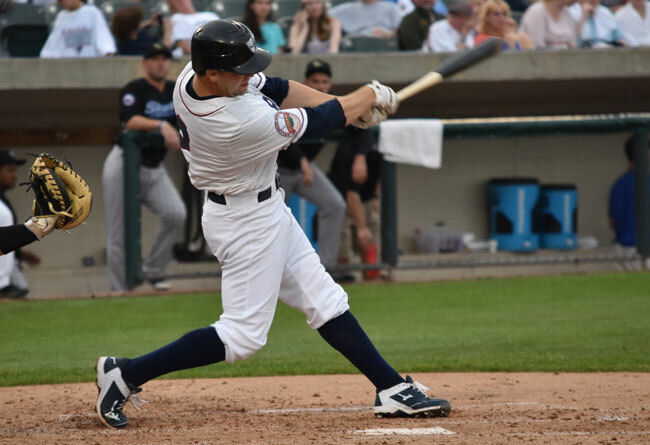 (Bridgewater, N.J. March 7, 2018) - The Somerset Patriots have re-signed infielder and fan favorite Scott Kelly for the 2018 season. Kelly enters his fifth season with the Somerset Patriots and fifth in the Atlantic League. The versatile infielder played in 101 games with the Patriots last year and split time between shortstop, second base and third base. He set a career high in appearances at both second base (44 games) and third base (34 games) while also playing 25 games at short. At the plate, Kelly hit .250 with one home run, 25 stolen bases and career highs in RBI (31), walks (38) and triples (four). His 25 steals ranked second on the team while he also finished third on the team in at-bats (340) and fourth in runs (52). The West Windsor, New Jersey native appeared in a career-high 116 games in 2016 and set career marks in hits (102), runs (66), doubles (17), and stolen bases (38) along with a .265 average. The 38 steals led the team and ranked fourth overall in the Atlantic League. The College of New Jersey standout began his minor league career with the Somerset Patriots in 2014 after earning an invitation to Spring Training from the team’s Open Tryouts. That year, he led the team in stolen bases (20) over his 92 games played. Kelly owns a .249 average with two home runs, 81 RBI, 170 runs and 90 stolen bases over 340 games in his four-year career with the Patriots. The 90 steals are the third-most in franchise history, just 26 shy of tying Michael Warner for second on the all-time list (116). The Somerset Patriots led the Atlantic League in attendance and made their 14th appearance in the playoffs last season. The Somerset Patriots will welcome their 7,000,000th fan in their 20th season at TD Bank Ballpark in 2018. Tickets are now on sale for the 2018 Season presented by Ford beginning at home on Friday, April 27th. For more information, please visit www.somersetpatriots.com.